Following up the release of its first full-length record in the U.S., Sony Music Direct (Japan), Inc., a division of Sony Music Entertainment Japan, Inc., has announced the U.S. release of a brand new EP by the Japanese pop artist/group, Ryo (Supercell). The EP's title track, "SEKIRANUN GRAFFITI" (SEKIRANUN means Thundercloud), is also the theme music to the latest Hatsune Miku PROJECT DIVA arcade console game and video game for the PSP, which will be released in Japan this fall. The release also contains the new single, "Fallin' Fallin' Fallin'," which was composed by Ryo and the celebrated Japanese Vocaloid producer known as Dixie Flatline. The SEKIRANUN GRAFFITI EP also contains instrumental and remixes of the two tracks. 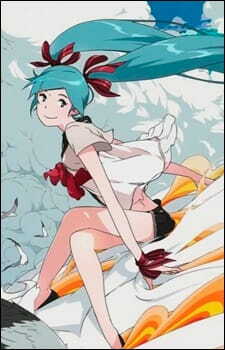 Cover art for the new release was created by Atsuya Uki. This is a music video, remember that. So we're judging this as we do with music, and not as anime. Please completely disregard the story and character ratings since there isn't much of these qualities in this video. The music is created by Ryo of Supercell fame. If you don't know who Ryo is and you consider yourself a fan of Vocaloid, then you should probably reevaluate everything in your lives. Make sure your not a tomato by looking into a mirror. Anyway, since this is Supercell the song is already going to be of quality work and is very reminiscent of HeartBreaker and When The First Love Ends. For those who haven't listened to those songs, the song would be categorized to the light rock genre, something Ryo has been known for. The art is beautiful, in the sense that the bubbly artwork really tells the a very bubbly and small story. If you've seen Usagi Drop or Aoi Hana, then you'll be oddly reminded of a recent anime that you've seen when watching this. It's a great music video that's actually inspiring on the side, for some reason. Anyway, this is about four minutes long, so it won't kill you to watch this. There's plenty of worse things you could do to eat your precious time. I bought the single when I was in Hong Kong. I just now watched the PV and it gave me goosebumps. I just think, we see our environment and find it beautiful and get these ideas: Flying, playing with the elements, things like that. And this PV just﻿ let me see how beautiful these secret silly wishes of ours are. This is an AMV with the Song Sekiranun Graffiti with Hatsune Miku. I am not really that big of a fan of vocaloid but this song had a different feeling to it especially with a good beat and lovely visuals. I do not know the lyric and didn´t really bother to look them up but it did feel like that they did fit with the visuals but I cannot really confirm.